If you have not opened the item, you can return the product to us for refund, credit or replacement within 30 days. 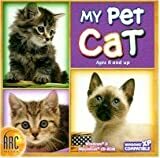 My Pet Cat is an interactive CD-ROM that takes you into the fascinating world of cats. Here are all the cat facts you need to help you choose and care for a cat. Always keep your cat healthy and happy and it will reward you with companionship and love. MY PET CAT. Sound and video. Cat screen-saver. Tips and techniques on health care. Photographs and illustrations of all the popular species. System Requirements for Windows. Windows 98/Me/XP. 386 processor or faster. 8 MB RAM. 640×480 monitor, 256 colors (16-bit color recommended). Windows-compatible sound card. speakers. 2X CD-ROM drive. System Requirements for Macintosh. Mac OS 7.0.2, OS X Classic mode. 8 MB RAM. 640×480 monitor, 256 colors (thousands of colors recommended). 2X CD-ROM drive.